This building overlooking the Middle Slipway dates from about 1720. It was used by the coastguard service as a watch house until 1799, when it was taken over by the HM Customs to keep an eye on the local shipping and, in particular, any smuggling. After the demise of the shipping traffic it became a private house. 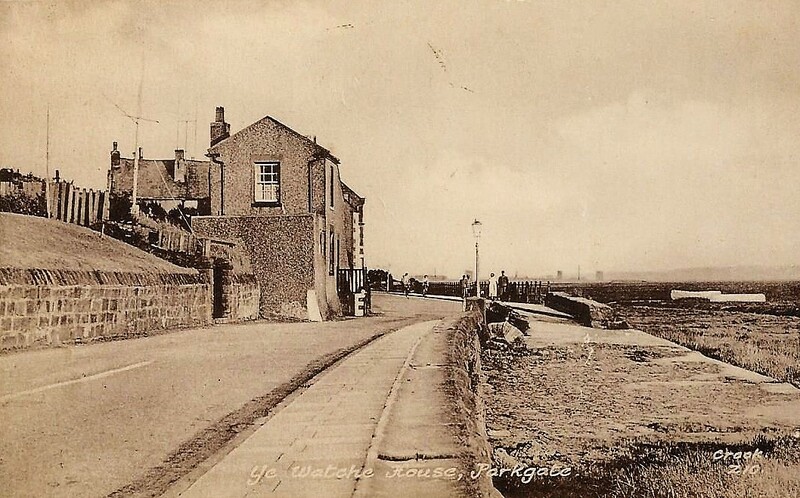 It is now much altered from its original form, but remains very much a feature of the Parkgate waterfront. 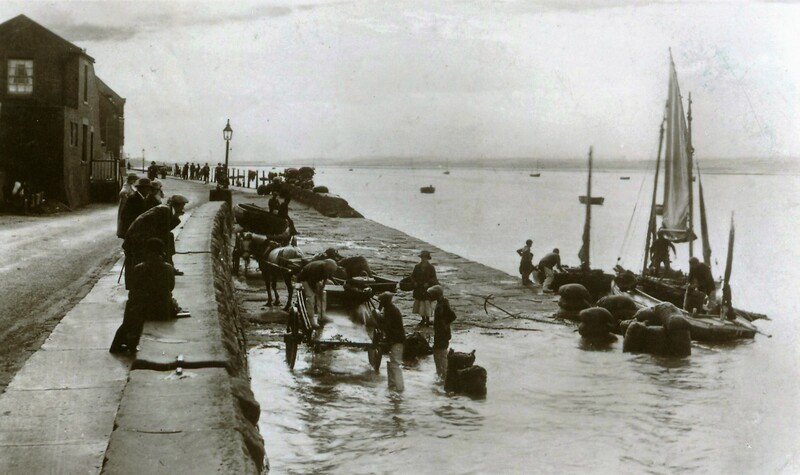 This location is probably the most photographed historical area of Parkgate, as the fishing activities undertaken here provided inspiration and subjects for generations of photographers over the years. Middle slip is where the Parkgate fishermen used to land their catches at high tide. Here a sizeable catch appears to consist of cockles, which will be conveyed by the waiting ponies to Parkgate station for onward transport to markets in Lancashire and elsewhere. By the 1940s the fishing methods were much the same. However the ponies and carts have been replaced by a lorry. In this photograph you can see the shell-fish catch has been bagged up and is almost ready to be loaded for its onward journey. 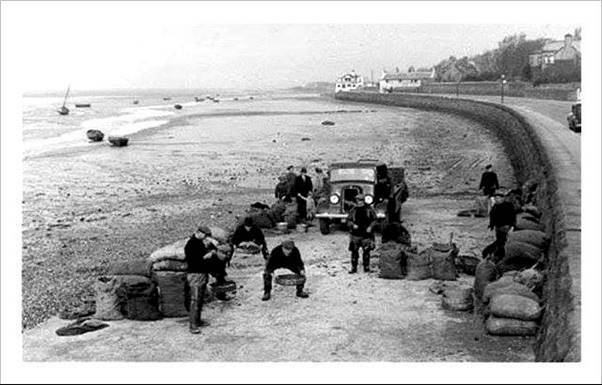 While most of the men are able to enjoy a bit of relaxation, three of them are still working, using a riddles to separate the catch from the waste. 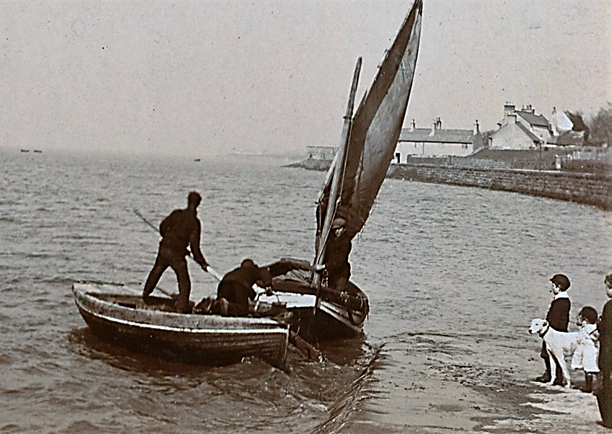 Where the men in the foreground are standing, the Parkgate Scoiety has installed a Hilbre class boat as a flower garden to remind people of Parkgates seafaring heritage. Tricky sailing off a lee shore! The tide is roughly in line with the present height of the marsh. Follow us on twitter by clicking the above button.